Those of you who know my husband know that Zack is obsessed with giving blood. He donates as often as he can and has a goal of donating in every U.S. state. So far, he's made it to twelve states. I have used my weight as an excuse to avoid giving blood (which doesn't work anymore post baby!). Instead, I donate my hair to women who have cancer, through Beautiful Lengths. When we lost Abraham, we inquired about donating his organs. We weren't able to, as we found out later, but that conversation lead to one of my care providers mentioning that I could donate my milk. Did you know that when your baby dies, your milk still comes in? I did, but many people don't know that. In the next couple of days, I searched online for information about lactation after loss, and all I found was a few lines about how to stop milk production. I had a Medela Pump in Style Advanced (PISA) and a Medela Harmony set (manual pump), thanks to my sister in law, but I wasn't fully prepared to exclusively pump. I was planning on breastfeeding and maybe once in a while saving one bottle's worth so that I could have someone else watch the baby while I worked out. I chatted with my doula group's lactation consultant, and she helped me figure out what other supplies to buy to go with the PISA. Then, she came to see me. She was incredibly helpful right when I needed it, on the day my milk came in. We worked out a pumping schedule, pump set up, and storage plan. (If you're in the Raleigh/Durham area and need an LC, email me for her info!) Another helpful resource for me was a Facebook group for exclusively pumping moms. My sister in law brought me sunflower lecithin, which I took once every day, and twice a day when I felt like I was getting more clogs. She also made me labels to fill out and stick on bags of milk. I started out pumping seven times a day, including one middle of the night pump. Each session I did ten minutes per side or fifteen to twenty minutes if both sides at once. Sleep was a priority for me and my healing, so at the encouragement of my support people, I dropped the middle of the night pump as quickly as I could, within a week. I continued pumping six to seven times a day for a few weeks. Then, I got thrush. Did you know you can get thrush when you're not feeding an actual baby? I sure didn't. And yes, I was taking probiotics! Ugh! Thrush felt like pins and needles and added more time to my routine with sanitizing the pump parts each session, washing my skin with 1:2 apple cider vinegar:water, air drying, and washing all of my towels and nursing pads in hot water after each use. I wish I could say I cured it with a low sugar diet, probiotics, and vinegar, but it took two rounds of antibiotics and eventually APNO to fix it. I'm convinced this was a spiritual attack. My supply decreased when I got thrush, and when it didn't get any better, I decided to start weaning. I tried quickly weaning by going as long as I could without pumping, no hot water or heating pads on my chest, and taking Benadryl. It ended with me crying in pain and a clog that felt about an inch wide, running from my collar bone down (maybe a slight exaggeration). I gave in, pumped, and decided to make a plan to slowly wean. It was painful to pump with thrush, but not nearly that painful. To wean, I cut out one pump session every three days. I shortened the two sessions I'd be combining in between those days when I cut a session. I used cold cabbage leaves once a day. Once I got down to three sessions a day, I dried up quickly. I knew from reading in the pumping group that my hormones would go crazy when I weaned, and that was absolutely true! I felt just like I had in early pregnancy--so so so hungry, nauseated, cramps, and major irritation. It only lasted a day or two, and I'd be glad to give you more info on how I dealt with that via email. I want to add a note in here that if you're a loss mom, and you just want your milk to go away, by all means put on some cold cabbage leaves, avoid heat and stimulation, take some Sudafed, and dry up (there are a lot more resources online to help you do that). THAT IS OKAY. This is the route I chose because it felt best to me, but it's not for everyone. I decided at the very beginning, at the suggestion of my support people, that I would stop pumping if it became stressful, and that's what I did. I knew I'd be at home healing for a while anyway, and I had a pump anyway, and the milk was coming anyway, so I may as well pump. I had watched my sisters in law pump, so to me it was completely normal. It may be weird to you, and you may not want to do it. Again, THAT IS OKAY. You have already done all you could for your baby. I was fortunate enough to have incredibly supportive family, friends, and care providers around me that made all the difference. I entertained several ideas of where to donate my milk, and I really wanted to know the people I donated to. 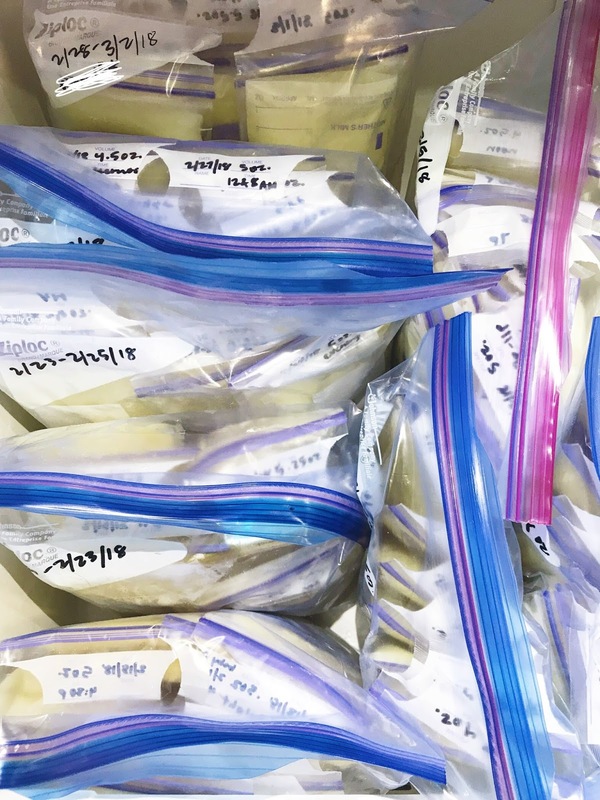 I'm fortunate to live near the Wake Med Mother's Milk Bank, which was an option I was open to if I didn't know anyone in need. There are also Facebook pages and groups like Triangle Milk Share and Human Milk 4 Human Babies that connect donors and babies in need. A friend was talking about donor milk for adoption, and that's when I knew the purpose for my milk! A family from our church in Georgia is in the process of adopting a newborn, so I reached out, and they said they wanted my milk! I was already praying for them and their baby, and now I'm even more invested. Please join me in praying for the Graves family. My pal Sarah came to visit this week, and she took my milk with her back to Georgia. I was a little sad to see it go, but I'm excited for it to serve its purpose. I pray that Baby Graves will have a great, well fed start to life, and that one day I'll get to meet him or her. Abraham gets to follow in our footsteps and donate his liquid gold to others. This is such an encouragement to me in the valley of recovery and missing my son. My body is amazing! I love comparing the color in my high fat early milk to later milk, seeing how I made what a baby needed at different times. I can help others, and as a fellow loss mom said to me recently, find that same silver lining she did by donating milk. Thank you so much for donating to my brother and sister-in-law and my new niece/nephew. I am so sorry for your loss! I can't even imagine. I just know God makes beauty from ashes and what you have done is beautiful to me and my family! You're so welcome! Thank you for your kind words. Baby Graves is loved by many people, for God's glory.